A rotating brush is used in conjunction with a machine that spins it on a cylinder or on a ring. This spinning motion cleans objects that come in contact with the brush’s bristles. 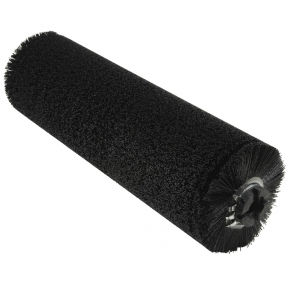 These brushes can be found on shoe polishers, street cleaners, conveyor belts, runway sweepers and more. Rotating Brushes A rotating brush is used in conjunction with a machine that spins it on a cylinder or on a ring. This spinning motion cleans objects that come in contact with the brush's bristles. These brushes can be found on shoe polishers, street cleaners, conveyor belts, runway sweepers and more. 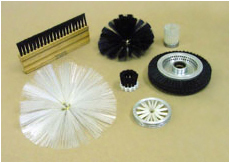 Rotating brushes are used in heavy equipment that is mobile or stationary. In stationary equipment, it can be mounted horizontally over a table or vertically on a pole. When brushes are installed vertically, two brushes spin parallell to each other and objects are passed in between them for throrough cleaning. 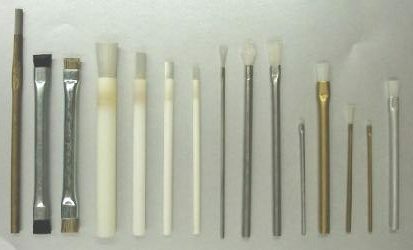 Rotating Brushes – Tanis, Inc. In mobile equipment like a street sweeper, there are usually gutter brooms on the outside that spin inward, guiding the dirt to a large rotating brush that sweeps it into the street sweeper's vacuum system. Very large rotating brushes mounted on a long cylinder are also used to clean the runways at airports. A runway sweeper removes any unwanted dirt and debris from the surface of the runway, reducing the chance of accidents or other complications during takeoff and landing. Sweeping a runway is a critical part of maintaining a safe environment for aircraft. A rotating brush can also be made using stainless steel wire for heavy duty cleaning and deburring applications. Rotating brushes are an important part of many industrial processing lines. Because they can be melted over a conveyor belt, the brushes make a convenient automated cleaning tool. Parts or products are moved beneath the rotating brush along the conveyor belt and they are scrubbed by coming into direct contact with the bristles. One application of this setup is found in many vegetable processing and packaging facilities. After the new produce has been sent through a wash, it use transported under a rotating brush that removes any grit or dirt from the surface before the food is dried off and packaged. Of course, consumer should still rinse their vegetables before cooking, but this process prevents them from being caked in dirt from the field when they reach your home. Over time the bristles of the rotating brush will wear down and it will need to be replaced in order to clean effectively in whatever application it is being used.